It’s again easy to get lost in HBO’s Westworld, both from a total absorption standpoint and in trying to deduce what possibly, or impossibly, is going on. Season 2 of television’s reigning most violent and perplexing series returns on Sunday, April 22nd at 8 p.m. (central) with 10 more episodes of twists, turns and assorted Gordian knots. Season One climaxed quite a while back -- on Dec. 4, 2016 -- so even devoted fans are advised to watch that finale anew before diving back in. The second season’s first five episodes have been made available for review under strict guidelines about “spoilers” or even revealing the identity of the actor who guests as “El Lazo” in Episode 2. But many of the head-swirling goings-on in Westworld are almost impossible to translate into print with anything approaching lucidity. It’s like trying to divine the thought processes of a certain guy who hadn’t been elected President yet when HBO’s Westworld and its sprawling, futuristic park first opened on a weekly basis. As in Season One, the series jolts into a higher gear whenever Ed Harris’ “The Main In Black” strides or rides into view. As revealed last season, he’s also the weathered, grown-old William (Jimmi Simpson), a “guest” who first visited the Westworld park decades ago. A wide-eyed lamb at the time, he eventually began to greatly enjoy the slaughterhouse and now is hell-bent to uncover whatever its central mystery is. Season Two also is built largely on the actions and reactions of two other pivotal holdover characters. The fourth wheel is Bernard Lowe (Jeffrey Wright), who began the series as the seemingly human head perfecter of the hosts’ software. He had a particular interest in Dolores’ well-being before learning he in fact was just like her. That’s because Ford had created him in the mold of his deceased partner Arnold, who belatedly had misgivings about the whole concept of Westworld and tried to stop it from opening. Yeah, it’s complicated. The path for now seems to be strictly one of revenge. “I’ve evolved into something new,” Dolores tells a quartet of humans. “And I have one last role to play.” Pause for dramatic effect. “Myself.” Dolores and her posse then ride off, leaving four humans to die by hanging after they can no longer balance themselves atop the tombstones on which they’ve been placed. At the same time, orders from somewhere on high are to kill all the remaining hosts. It’s a veritable Civil War. One of Dolores’ partners in arms is host Teddy Flood (James Marsden), who still believes, in so many words, that “there’s a place for us” -- and a peaceable one at that. Previously programmed to shoot up an entire town, Teddy is becoming averse to mayhem. Let’s just say this doesn’t sit particularly well with the love of his life, so to speak. It’s a riveting, out-of-body hour that might remind some viewers of the Netflix anthology series Black Mirror, where technological “advances” invariably are anything but. Episode 4 also ends with a revelation that’s actually fairly easy to comprehend. But it also introduces yet another BIG QUESTION to be answered whenever. 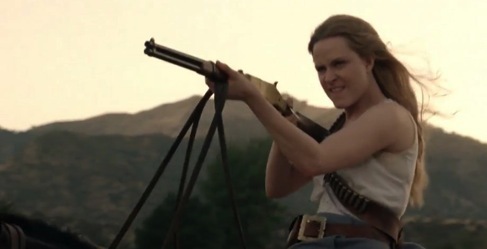 Wood’s Dolores is not in Episode 4, which is so good that she’s not really missed. But as her once passive host character comes alive, so does Wood’s performance. Newton’s Maeve also is reborn, giving Westworld a double shot of women’s empowerment. But Harris’ “Man in Black” is still the one to watch, taking full command of every scene he’s in. Meanwhile, Wright figuratively stumbles about as a host who didn’t know he was a host -- and now doesn’t seem to know which way is up. Perhaps a fresh injection of essential “cortical fluid” will help to somewhat remedy that. Throughout these first five episodes, Westworld continues to have a mind-bending mind of its own, sometimes to the point of being close to nonsensical. It’s also a non-stop killing field, and that gets to be off-putting after a while. But Westworld also remains picturesque, challenging and undeniably distinct. It will be judged in the end on whether it all falls apart -- or somehow extricates itself and emerges as a comprehensible whole. It’s still way too early to know if we’re being diddled on a grander scale than Lost or The Leftovers ever contemplated. The world of Westworld currently is all over the place, sometimes making the Westeros of HBO’s Game of Thrones seem like a small burg. Both series are bathed in blood and retribution. But with Game of Thrones, all eyes are on a concrete prize, namely the Iron Throne. In Westworld, the final objective is not nearly so clear. You want clarity? Dream on.